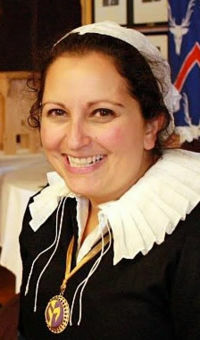 I am Mistress Amy Webbe, and I am a 1570s Gloucestershire resident. As a Middle Class widow (a rather unfortunate accident with a cart), I assist my stepson in managing his late father's mercer business. I spend much time embroidering, and considering whether or not to seek a new husband. I was raised in and still follow the Roman church, but I prefer to do so privately, as being a "Papist" is beginning to affect the business opportunities available in Southern England, and I have no desire to endanger the family business. East Kingdom Minister of Arts and Sciences, 8/2015 to present. Rankings Clerk, Keepers of Athena's Thimble, 08/11 until present. 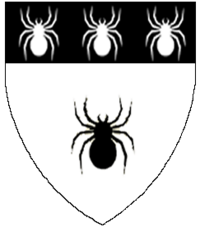 A&S Officer, Barony of Carillion 11/11 until 11/12. A&S Officer, Canton of the Keep by the Endless Sea, from 9/09 - 11/11. Deputy A&S Officer, Barony of Carillion, 10/10 - 11/11. Deputy to Middle Eastern Tent Coordinator, Pennsic XL. Class Coordinator, Southern Region War Camp (RP), June 2012-2013. Assistant to Class Coordinator, Southern Region War Camp (RP), 2011. Co-Autocrat, Bellringers 2012 and 2013. Troll-as-needed, Icefalcon's Ducal Challenge, 2012. Children's Activities, Mudthaw (RP), 2012. Royal Liaison, 12th Night (RP), January 2012. Pennsic University Ambassador, Pennsic XL. Children's Fete Volunteer, Pennsic XL. Co-Troll, Ghosts, Ghouls and Goblins, 2010. Volunteer- Disability Point, Fighter Check-In, Pennsic XXXVIII. Assistant Dayboard Cook, Al-Hafla 2009. General set-up and clean-up, as needed. Senior Member of Athena's Thimble. My primary area of study is 16th century English embroidered clothing, with an emphasis on English monochrome embroidery (blackwork). I am a member of House Grog. I was apprenticed to Baroness Kis Maria, known as Mika. This page was last edited on 10 April 2019, at 09:35.